The heavier a wheelchair is, the more difficult it is for a person to move it. If your loved one has been using a standard wheelchair, he or she might struggle to move the chair up hills. You might have also found that it’s difficult to push the chair on hills or other uneven surfaces. Lightweight and ultra-lightweight wheelchairs are the perfect solutions for the person on the go. The wheelchair’s weight and size makes them easier to transport as well as easier to manipulate. You’re more likely to go out and about when you’re able to pick up the wheelchair and quickly stow it in the trunk of a car. Not all ultra-lightweight wheelchairs are the same. Some have a variety of features that make them more comfortable than others. The chairs also come in a range of sizes, so that you can find a model that fits your loved one. What’s the Difference Between Lightweight and Ultra Lightweight? The big difference between a lightweight and an ultra-lightweight wheelchair comes down to weight. Although a “lightweight” chair does weight less than a conventional chair, many people would still consider this type of chair to be too heavy. Some lightweight models weigh 30 to 40 pounds, and that’s before you attach the rigging or leg rests. Meanwhile, ultra-lightweight wheelchairs typically weigh under 25 pounds. Some define an ultra-lightweight chair as being under 19 lbs. It’s also possible to find models that weigh in at less than 15 pounds. Both lightweight and ultra-lightweight wheelchairs can feature aluminum frames. Aluminum is a considerably lighter weight metal, especially when compared to steel. Some ultra-lightweight models feature titanium frames. Although titanium weighs a lot less than other metals, it also tends to command a higher price point. One thing to look for when choosing an ultra-lightweight wheelchair is whether the chair has a folding frame or a rigid frame. There are pros and cons to both options. People often assume that folding frames are easier to transport than rigid frames since you just collapse the chair and stash it away in a car. But a rigid frame ultra-light wheelchair often comes apart easily for transport. Plus, rigid frame styles typically have a simple design that makes it easy to stow them in a car or trunk for travel. Another benefit of choosing a rigid frame model over a folding frame wheelchair is that rigid frames tend to provide a smoother ride. Since they don’t fold down, there are fewer moving parts, which means there’s less jostling on the road. Additionally, the designers of rigid frame chairs often create them with movement and sport in mind. Folding chairs aren’t without their benefits, the main one being that you can collapse them for quick storage. They also tend to have features such as armrests and leg rests, which you might not find on a rigid frame ultra-lightweight chair. A wheelchair’s comfort largely depends on how well it fits a person. A wheelchair that’s too small can cause skin problems while a wheelchair that’s too large can cause the hips to roll inward, putting strain and pressure on the legs. Before you invest in a wheelchair, it’s a good idea to measure the seat width of the person who will use it. To do that, measure across the widest part of a person’s thighs while he or she is sitting. Add one inch to the measurement to allow room for the chair’s fabric. If you’re going to give the person any cushioning while in the chair, add the thickness of the cushions to your measurement too. There aren’t unlimited options when it comes to wheelchair seat width unless you are going with a custom-made model. A seat width of 18 inches tends to be the most common, although you can find models with 16-inch and 19-inch widths as well. Seat depth is another consideration when picking out a wheelchair. When the seat is too deep, the edge of it will press into the back of the knees, creating circulation problems. A seat that’s too shallow strains the legs, as they don’t have enough surface support. To find the right seat depth, measure your loved one from the back of the knees to the back of the buttocks, while he or she is sitting down. You’ll then want to subtract 2.5 inches from your measurement to allow room for the seat cushion and fabric. When it comes to seat height, wheelchairs often come in three sizes: hemi, standard and tall. A hemi seat height is usually about 17.5 inches off the ground. It’s the most appropriate height for people under 5 feet, 5 inches tall. A standard seat height is usually 20.5 inches off the ground and is ideal for people between 5 feet, 5 inches tall and 6 feet, 2 inches tall. People over 6 feet, 2 inches often benefit from a tall seat, which is usually 21.5 inches off the ground. To see if the seat is the right height, have your loved one sit in the chair. His or her feet should just touch the ground, but shouldn’t drag. If the feet dangle in the air, the chair is too tall, and it will be difficult to get into and out of it. Size and frame style aside, there are a few additional features to look for in an ultra-lightweight wheelchair. Fixed vs. Removable Armrests. Removable armrests can make it easier for you to help your loved one into and out of the chair, but they can get lost. Some models offer flip-back armrests, which swing out of the way but remain attached to the chair. Full or Desk Length Armrests. Full-length armrests are bigger and provide more support, but desk length armrests allow a person to roll his or her chair under a table. Swing-away or Elevating Leg Rests. Many ultra-light wheelchairs come with swing-away leg rests as standard. But you have the option of upgrading to elevating leg rests, which allow you to lift the legs up and help minimize swelling or circulation issues. Rear Wheels. Although many ultra-light models have large rear wheels that enable a person to propel the chair while sitting in it, some models have smaller wheels and need someone else to push them. 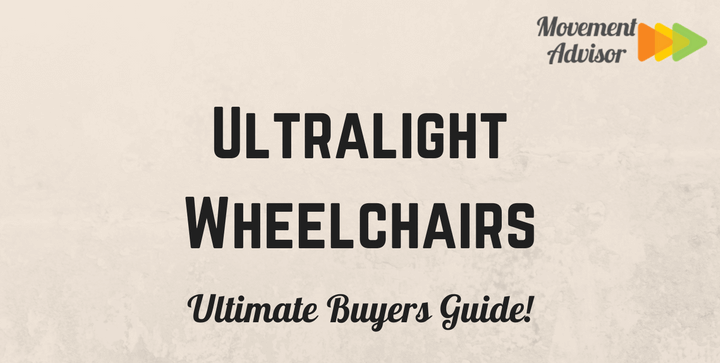 There are a lot of ultra-lightweight wheelchairs on the market. Here’s a small sample of some of the highest rated and best ultra-lightweight wheelchairs available. The Drive Medical Fly Lite Ultra Lightweight Transport Wheelchair weighs in at 17 pounds. With the rigging (leg rests) attached, it comes in at just under 24 pounds, meaning it’s light enough to push easily and to fold up and stow away with ease. The wheelchair is a transport style, which means it has smaller wheels instead of two larger back wheels. It offers a relatively smooth ride even though it’s a collapsible style. Since it does need someone to push it, it’s better suited for occasional use rather than as an everyday chair. One drawback of the chair is that it’s only available in one size, with an 18-inch seat width and a 15.25-inch seat depth. The seat height is 18 inches. The Karman Healthcare S-105 Ergonomic Ultra Lightweight Manual Wheelchair puts comfort above all else. The chair has a specially designed, ergonomic seat, as well as ergonomic armrests. The design of the seat and armrests is meant to minimize pressure points and reduce the risk for sores when a person needs to be in the chair for an extended period. The chair weighs 27 pounds, meaning it’s on the heavier end of the ultra-lightweight spectrum, but is still considerably lighter than standard models. The chair has limited options when it comes to armrests and leg rests. Both are fixed and can’t be swapped out for a different style. That means if you want a chair with elevating leg rests or with armrests that can swing out of the way, you’ll be better off choosing a different model. At the higher end of the price spectrum is the Invacare Top End Crossfire T6 Rigid Wheelchair. A rigid frame model, it weighs less than 20 pounds and is designed for people with a fair amount of upper body strength. If your loved one is still relatively active, this is the wheelchair for him or her. A wheelchair is meant to make life and mobility easier for the person using it. Ultra-lightweight models do just that. When choosing the best ultra-lightweight wheelchair for your loved one, be sure to think about his or her size as well as when and where he or she will use the chair.